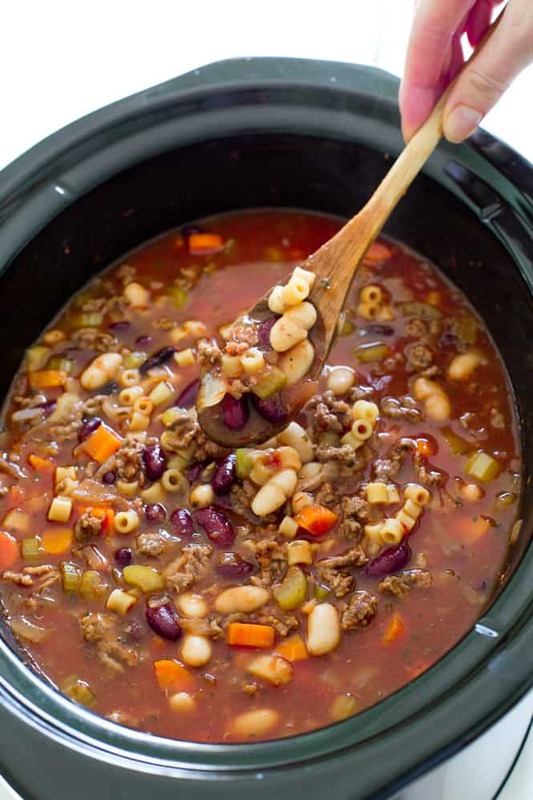 Super Easy Slow Cooker Pasta e Fagioli Soup. Rich, hearty and loaded with veggies and meat. A perfect, comforting soup for Fall! Hi guys! It’s Kelley back from Chef Savvy! 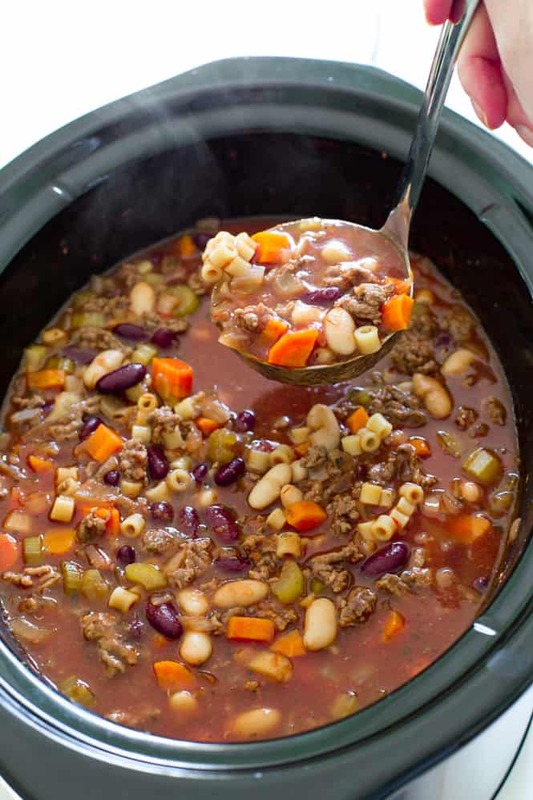 Today I am sharing one of my favorite soups: Pasta e Fagioli. This is comfort food at it’s best. 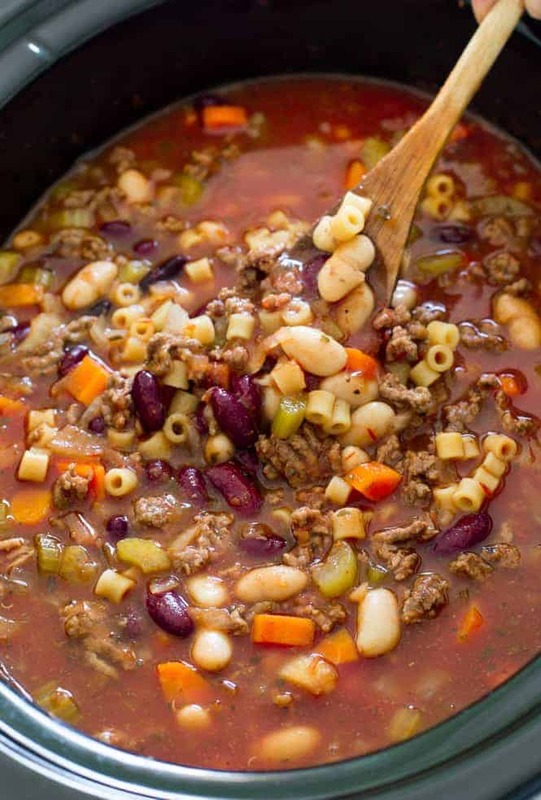 Super hearty, meaty, thick Italian soup loaded with veggies, meat and beans. Best of all this soup is made in a slow cooker. That means little to no prep time and lots of flavor. This soup simmers low and slow for 8 hours! This soup takes just a bit of prep time and is super easy to throw together. I like to brown the meat for extra flavor and throw it into the slow cooker with the rest of the ingredients. I like to add in the pasta and beans about 30 minutes before serving. This ensures they are tender but not soggy. 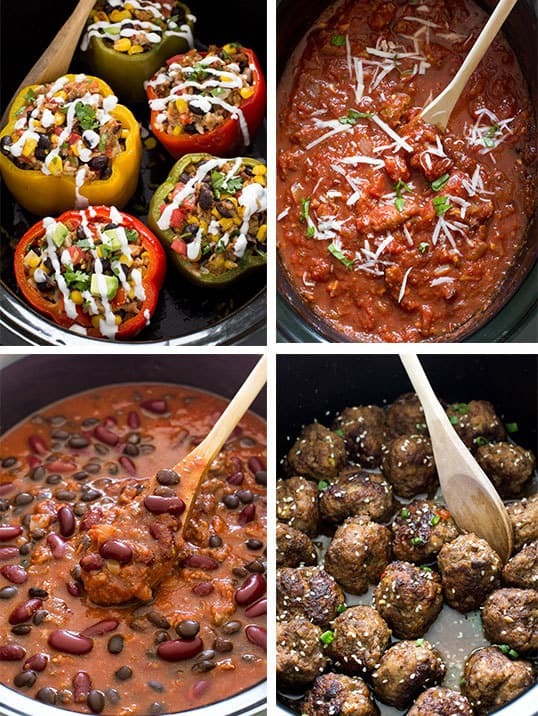 Looking for some more Slow Cooker Recipes? Here are a few of my favorites! I made this today and it turned out perfect, I did add some sweet Italian sausage with the hamburger, I was out of fresh garlic so I added a teaspoon of garlic powder, and 2 teaspoons of white sugar. This recipe makes a huge amount so I will freeze some to enjoy later. Can this pasta e fagioli soup be frozen? Have made this soup 2 times already and it is delicious! thank for sharing. Just wondering if anyone has adjusted this recipe for an Instant Pot? We LOVE this recipe…just wanted to make it quicker! I would love to know instant pot adjustments as well! This recipe turned out excellent! I followed the recipe exactly and it’s so thick and full of flavor. Thanks so much for sharing! Well, I am sick of eating pizza at work, and since if we have a choice we order out soup, I thought I would give this a try. My friend posted it on my Facebook page. My Nana’s recipe is meatless, but I got some.sausage from our neighborhood butcher to substitute for the ground beef, and it is simmering in my crockpot now. My kitchen.smells SSSOOOOO good, and I can’t wait to take.it to.work tomorrow to try it !! I make this all the time. Def a keeper in our rotation. Even the baby loves it. Thank you! The recipes shows a serving size of 8. Is the serving a cup or 1/2 cup? Can you provide? Yes! I like to use myfitnespal.com for any nutritional information.